You’re gonna need some booze to get through this. You’re trying to score with this chick named Zuzu Zither. She’s learning to play the Appalachian dulcimer. Trivia: The Appalachian dulcimer is also known as the hog fiddle. The more you know. The crest of the golden eagles marks an unusual whiskey. Of the hundreds of whiskeys in the world, none is better made than this. Imperial: light and good-natured — it mixes well. 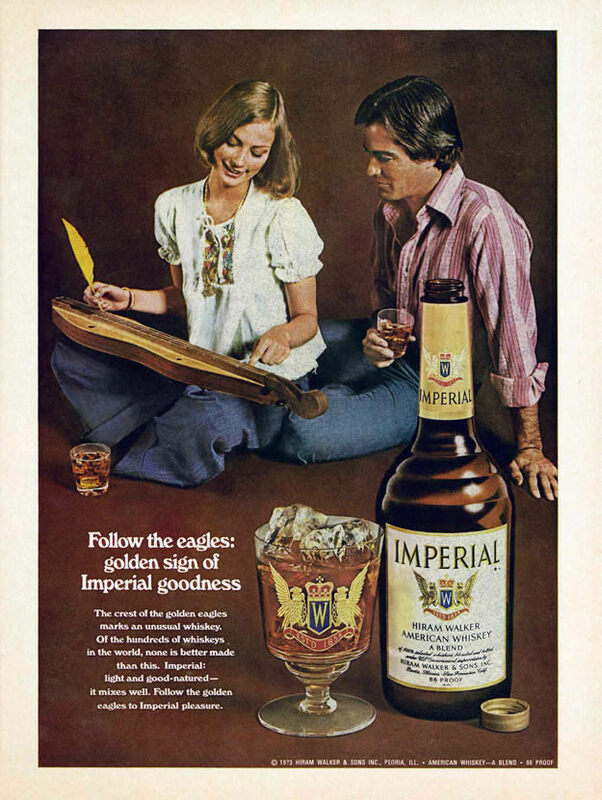 Follow the golden eagles to Imperial pleasure. This entry was posted in ads of yore and tagged 1970s, 70s, ads, advertisements, advertising, alcohol, appalachian, drinking, dulcimers, hard liquor, liquor, magazine ads, print ads, seventies, spirits, vintage, vintage ads, whiskey on January 25, 2017 by Clayton Hove.